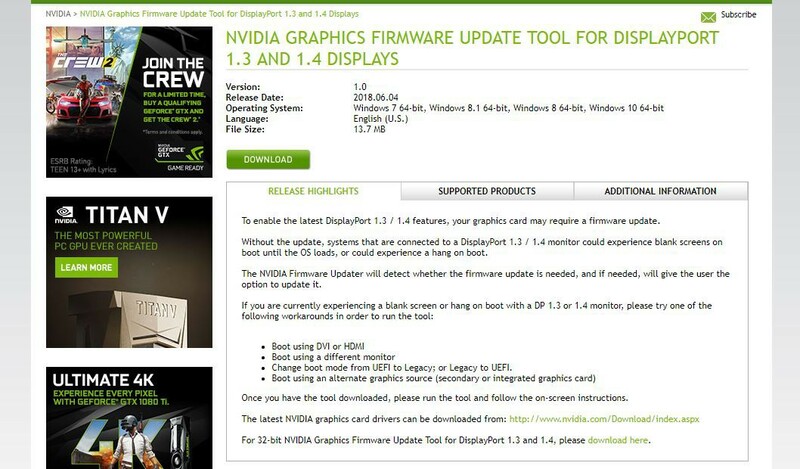 NVIDIA has issued a firmware update that fixes some issues with DisplayPort 1.3 / 1.4 monitor connectivity and enables the latest features over the same interface. With this fix, you will not see anymore blank screens, system hangs and bootloop with DisplayPort cable plugged in. The update also readies GeForce owners for HDR G-Sync gaming monitors. This firmware is necessary if you want fix your DisplayPort issue. Since a software update wasn't enough, NVIDIA has released a complete firmware. In order to run this tool, you have to use a DVI or HDMI cable since the DisplayPort connection will be temporarily disabled. According to a post of TenForums, this firmware update flashes only the UEFI GOP. In other words, you will not see any change in software like GPU-Z. The firmware update is compatible with GeForce 700 Series cards and newer, Maxwell Titan and newer, and Quadro cards. If you want know more about this update, we suggest to visit NVIDIA official website since you will find all the supported products.